Wednesday evening a Kingston church hall was filled to overflowing for a Community Feast. 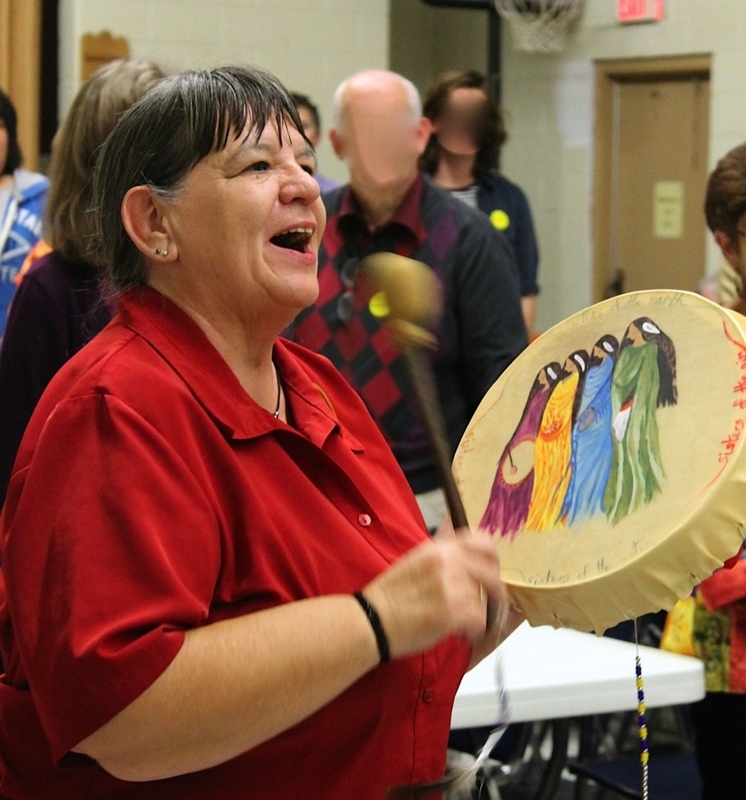 We were called together by two groups: the Katarokwi Indigenous Grandmothers Council and KAIROS, the social justice initiative of eleven Canadian Christian churches and agencies. We were there to take up the journey towards healing and reconciliation and ‘reset the relationship’ between indigenous and non-indigenous neighbours. The traditional food of three sisters soup, bannock, wild rice and buffalo stew was complemented by salads and desserts of a typical church pot luck. Words and music were shared. 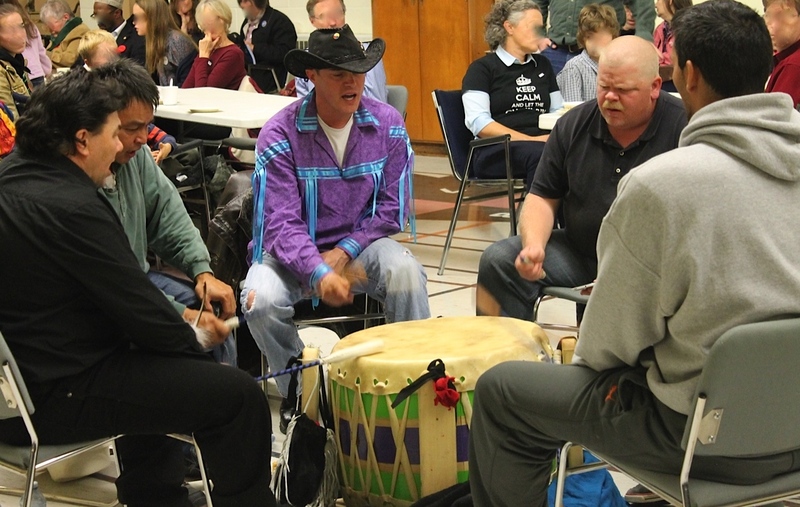 And it all began with the voice and rhythm of the Grandfather Drum, offered by the Shimmering Waters men’s drumming circle. Sunday morning we shall gather to acknowledge the voice and rhythm of God known through the scriptures. We continue our exploration of the Ten Words (as the ‘commandments’ are more appropriately translated from the original Hebrew) and hear ‘Do not commit adultery’. It might sound initially sharp and hard, but as it reverberates in heart and soul and over great swaths of human experience, and particularly through all known in the ministry, death and resurrection of Jesus, we recognise the faithfulness that beats throughout God’s relationship with humanity, and the best of our relationships with each other. Wednesday evening concluded with the sound of other drums. The Sisters of the Drum circle lead us out of the hall with a travelling song, a moving exhortation to take up the joy of the feast and to live it in the days to come. My only prayer for our service of worship of God tomorrow morning is that we might take up God’s way of faithfulness in our own relationships, personal and social. People are unreasonable, illogical and self-centred. Love them anyway. Honesty and openness make you vulnerable. Be open anyway. Neglect and betrayal are often experienced. Be faithful anyway. What you spend years building may be swept away overnight. Build anyway. A service of worship may be dull and uninspired. Worship God anyway. They say that a kingdom of peace and justice is not of this world. Live in trust of God anyway. Have a look at our order of service and if you are in the area, I hope you can join us.